"A fantastic way to enjoy lasagna without all the fuss! I thought using frozen ravioli already filled with cheese instead of layering layers of noodles and cheese would make a great dish so easy. It all comes together; just scoop it out, serve with a salad, and enjoy." Heat a large skillet over medium-high heat. Cook and stir beef, garlic, garlic powder, salt, and pepper in the hot skillet until meat is browned and crumbly, 5 to 7 minutes. Drain and discard grease. Stir pasta sauce, Italian seasoning, basil, and oregano into ground beef mixture. 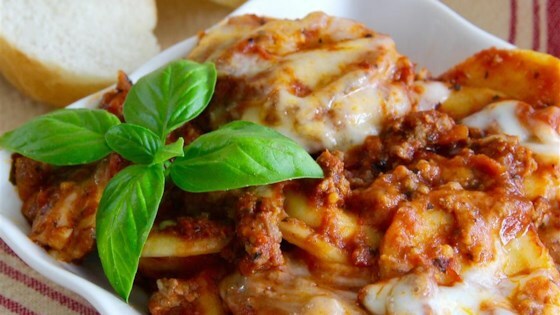 Ladle a generous layer of meat sauce into the bottom of a slow cooker; add a layer of ravioli. Ladle another layer of meat sauce over ravioli layer; alternate with remaining ravioli and meat sauce until all ingredients are used. Cook on Low for 3 to 5 hours. Sprinkle ravioli mixture with mozzarella cheese and continue cooking until cheese is melted, 45 minutes to 1 hour more. Using two jars of pasta sauce yields a much richer product. If you don't like as much sauce, you can use a single jar. The seasonings can be adjusted to your tastes. I prefer a generous amount. There are some things that shouldn't be made in a slow cooker. This is one of them. Very good and VERY easy. I used 4 jars of pasta sauce and 30 ounces of raviloi. This does make a lot of food, but the leftovers should reheat well. I will be making this often.